It's been a big few days here. We had a scare in our household--our boiler decided it needed some attention. That's not scary in a more temperate climate, but it was solidly in the "extreme cold warning" range in Manitoba. That meant real temperatures of -30 and windchills of -40. (That's darn cold in both Celsius and Fahrenheit.) I spent much of last week taking care of that, but thank goodness, we are all warm and safe. A home with no heat is not a good option with those kinds of wind chills. And, this sweater has been in constant use during this cold snap! We love it here. It uses a lovely soft yarn, Quince & Co. Puffin, which I would normally deem a bit too precious for use in a kid's school sweater. However, someone else donated it to Upcycle, in Alexandria, Virginia. We visited Upcycle to do a play group with friends while on a trip to see family. 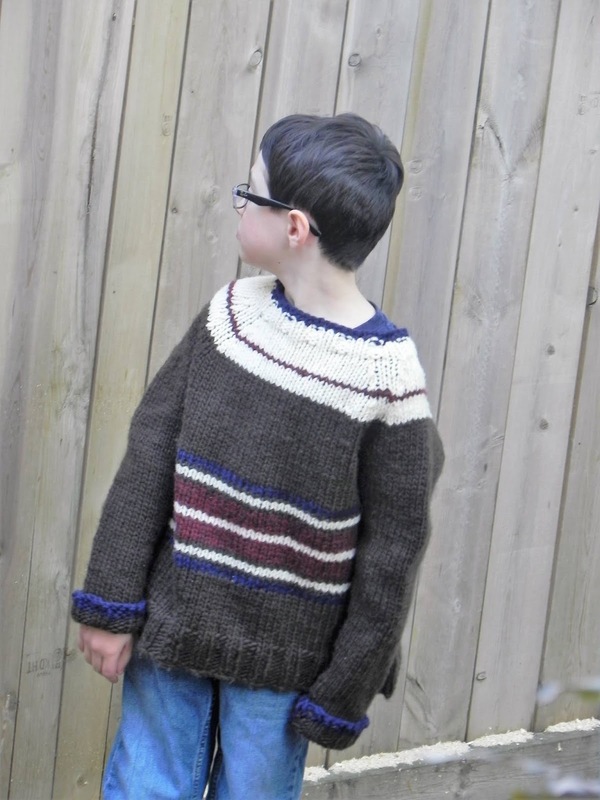 And I lucked out with enough of this brown yarn to make most of a kid's sweater....and design one, too. Finally, in 2007, I won a fiction contest for a short story I wrote. (Wow, that was 12 years ago!) The magazine, Jerry Jazz Musician, has been doing an amazing retrospective on their fiction contest, and they featured me! To read the feature, check out this group of profiles, and scroll down. I won contest #15.